September in Tuscany is harvest time, which means experiencing local parties, festivals, music, cultural and traditional exhibitions, all aimed to promote local habits and those villages where they take place…but mainly it’s wine time! Obviously, it couldn’t be any different! If grape harvest is the subject of our interest, wine is nothing other than the fruity protagonist of this typical Tuscan digression, even if local food specialties that usually come with it don’t seem to be less important, going by their international success!!! If I’d match the word wine with the name of Montecarlo, what immediately comes to mind? It mainly depends on how much you love wine and know about the well-renowned nectar of the gods… Well, the answer is easier than you might imagine: if you associate the name of Montecarlo with that nice francophone country, where the Moto and Formula 1 Gran Prix (using a French expression!) take place annually (and where the Royal family rules), I’m sorry to tell you that you dropped a clanger! As we use to say about Montecarlo, that country that has just come to your mind is nothing more than a copy of the only, unique and original Montecarlo in the province of Lucca! You should know that among those grapevines, thousands and thousands of the most prestigious Italian and foreign (mainly French) grape varieties annually produce different kinds of red and white wines, which have gained the noteworthy DOC quality assurance label for satisfying high quality standards. And as every wine production place worthy of the name, Montecarlo also welcomes and celebrates the September harvest with a typical Tuscan festival, known in both the provinces of Lucca and Pistoia (being modest!) and has become a traditional event that grownups and kids alike can’t miss out on! 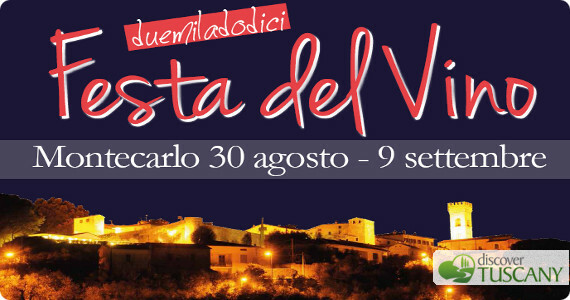 Montecarlo 2012, Terra di Vino (wine land in English): this is the name of the wine festival that this year will take place starting August 30th through September 9th in the old center of the village and the tiny streets leading off with various stands, among which the wine-and-food ones will be crowded with people queuing to taste local specialities (such as ham, salami or cheese) that, as is well known, must go with wine (which can’t be taken on an empty stomach, mainly when tradition wants people to exaggerate a little bit!). In particular, I highly recommend you try the coccole (fried salt round-shaped bread) with ham, and the delicious frati, which aren’t a blasphemous expression, but just fried, sweet doughnuts (there are many other varieties of food besides fried stuff, but I suppose you’ve already understood I particularly love these!) The little squares will come to life with people, music, theme exhibitions, cultural festival and promotional events: a delightful accompaniment to all those “bright and cheerful by definition” evenings..! On the Montecarlo official website you may find further information about this event, which you could even take advantage of to enjoy a longer vacation in this part of Tuscany rich in nature, culture and traditions, where you’ll be spoilt for choice among the many wine roads and farmhouses to explore! Montecarlo is near Pescia, on the road leading to Altopascio. I think there’s no point to add that car is the easiest way to reach those old villages, but remember that drunk driving is highly dangerous, so, who drives, doesn’t drink, that‘s the rule! As an alternative, you could check the train timetables to get to Montecarlo directly, but there aren’t many trains stopping there, or to Pescia or Altopascio and then take a bus to get to your destination. Another choice could be to take a bus from Altopascio to Montecarlo (it may take longer but you don’t have to change any buses). That said, there’s nothing for me to add but…drink carefully as well as ENJOY!